Studio MAKY with Double Dragons in the news! 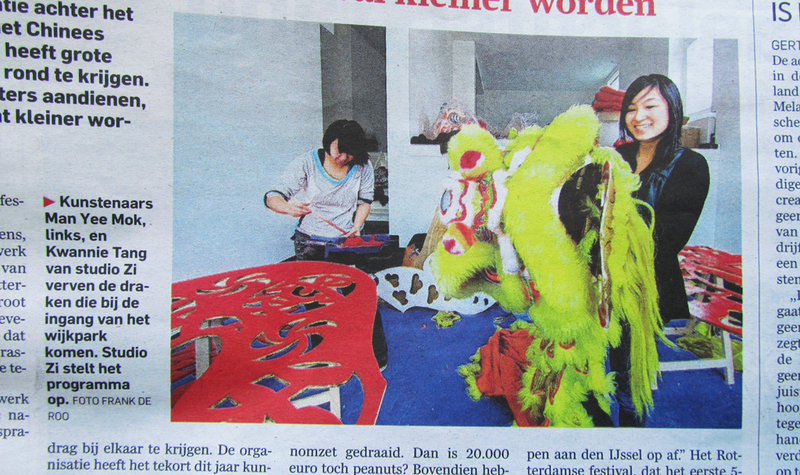 For the Rotterdam Chinese New Year Festival, we finished our happy, lucky Double Dragons! During the making-of process we’re happy that our work was in the Dutch newspaper AD, promoting the festival which is also programmed by Studio Zi. The Chinese New Year Festival was a great success, the Double Dragons welcomed more than 15.000 visitors on the sunny festival day in Chinatown of Rotterdam. After the festival the lucky dragons were moved to their next destination in the cultural house of stories ‘Verhalenhuis Belvédère’ in Katendrecht. They will be a part of the interior during the exhibition ‘Shanghai Tan’ and Museumnacht on the 8th of March. We both will participate the Museumnacht as members of the art collective Studio Zi with other Zi-artists and designers. Entrance is free!